This front-end cover is the ultimate in protection with a custom fit that helps defend the hood and front fenders of your vehicle from elements such as stones and insects. The durable construction enables you to open the hood without removing the cover. Made of breathable material with a polyester and floss backing to protect the body paint, there`s no need to remove this cover when it`s wet. 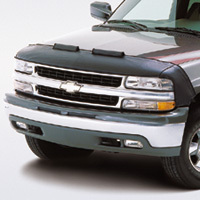 All front-end covers include a hood cover. Hood covers are also available separately.